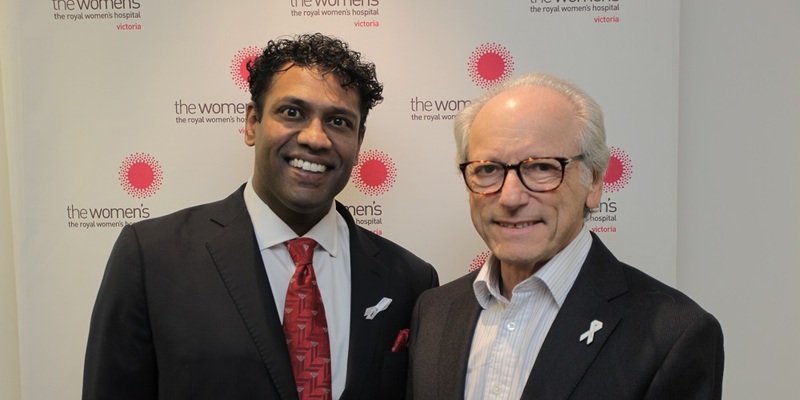 Associate Professors Les Reti and Vinay Rane are helping the Women’s to reach White Ribbon Australia Workplace Accreditation. Both A/Prof Reti, Clinical Director of Gynaecology, Cancer Services and Clinical Governance, and A/Prof Rane, a consultant obstetrician gynaecologist, have witnessed first-hand the damage violence committed by men can cause not only the individual woman but society as a whole. In their roles as White Ribbon Ambassadors, the two actively stand up, speak out and act to prevent men’s violence against women in our community. A/Prof Reti has been professionally involved in the prevention of violence against women since 1985. Following a scholarship to attend the National Coalition Against Sexual Assault in the USA and visits to various American sexual assault clinics, A/Prof Reti investigated the management model of all the sexual assult clinics in Australia. He was subsequently involved in setting up the Centre Against Sexual Assault (CASA House) at the Women’s and chaired its first committee of management. More recently, A/Prof Reti has convened the White Ribbon events at the Women’s and regularly addresses community forums on domestic violence. A/Prof Rane has worked in clinical forensics, the law and in obstetrics and gynaecology. Making a very conscious decision about the kind of world that he wanted his three daughters to grow up in, A/Prof Rane became a White Ribbon Ambassador to help construct a safe community for everyone. Taking the White Ribbon pledge brings him closer to that goal. White Ribbon Australia Workplace Accreditation is a program that uses the workplace as a setting to address violence against women and to support staff experiencing family violence. If you see A/Prof Reti or Rane around Parkville or Sandringham, feel free to chat with them about their Ambassador work. Get involved in the White Ribbon campaign by signing up to be a White Ribbon Advocate at whiteribbon.org.au.